WHEN: Customized to your request. This volcano Slamet hike leads you up summit of volcano Slamet +-3429 m, the highest active volcano summit of Central Java region. Experiences volcanic environment that so typical for volcano Slamet due to it's "Crater inside The Craters ", hike down to crater sandy base when ever it possibly done, and catch sunrise momentum slowly light volcano Slamet towering over mist morning day. This volcano is getting well known due to it's Strombolian and Vulcanian types of volcanic eruptions, also for it's richness of flora-fauna along below volcanic zone. The tropical mountain forest offer freshness of air, so you can much expect to experience tranquillity of the mountain. How ever, the trip is focusing to explore volcanic zone of this highest Central Java's volcano to get more insight about it's volcanic phenomenon. 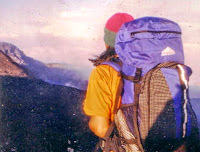 This trekking trip is much more suitable for experienced hikers-climbers-trekkers possessing good stamina / good fitness level due long drive round trip Yogyakarta - Trekking Basecamp, and physically challenging hike up and down the terrain of volcano Slamet.